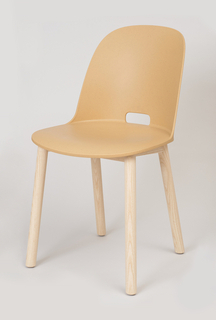 See more objects with the tag furniture, upholstery, seating, chair, molded, domestic interior. This is a Chair. It is dated 1940. Its medium is molded and spliced plywood, turned and veneered honduran mahogany, foam rubber, woven textile (upholstery). It is a part of the Product Design and Decorative Arts department. 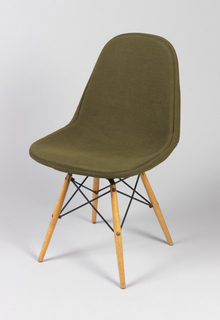 This chair design, formulated by Charles Eames and Eero Saarinen, has both a significant exhibition history and represents a groundbreaking moment in chair construction process. It was a winning entry in the “Organic Design in Home Furnishings” Competition at the Museum of Modern Art, New York in 1941. 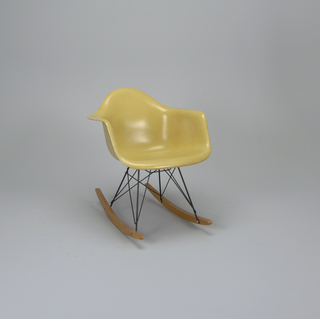 The competition, as Eliot Noyes outlined in his introduction to the exhibition catalogue, aimed to end “design inertia” and to “foster a collaboration between designer, manufacturer, and merchant” to encourage new designs that break from historical styles to “create a better environment for today’s living.” While at Cranbrook Academy, Eames and Saarinen designed the chair, whose clean curving lines showed a form strikingly different from anything else on the market. 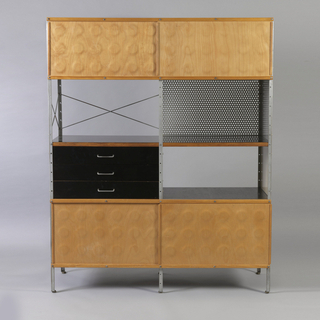 It was one of the first pieces of furniture produced by either designer and represented a strong starting off point for their future practice. For those winning designs, the MoMA arranged for contracts with manufacturers. 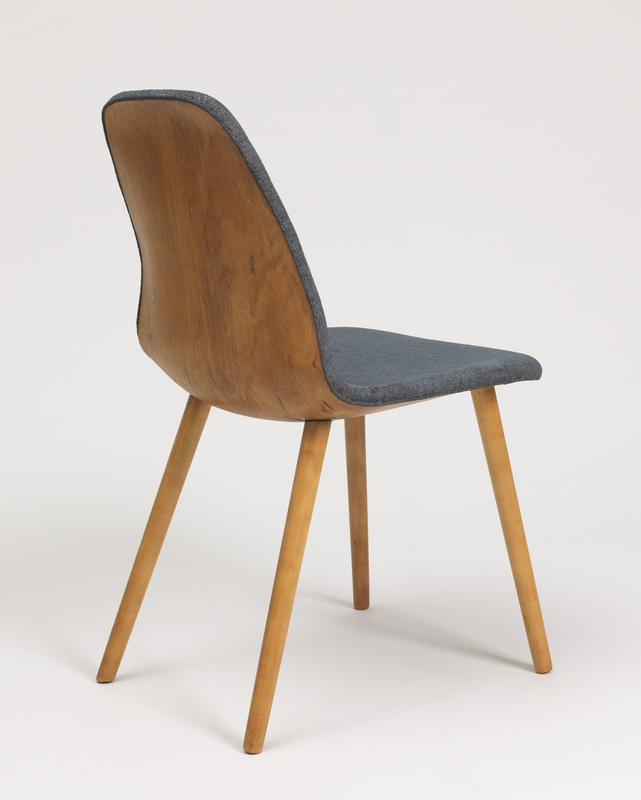 In order to achieve the compound curves of the chair back, Saarinen and Eames worked with the Haskelite Manufacturing Corporation, a company who had developed a process to mold plywood for shells for boats and planes. This method was applied to furniture here for the first time. The exposed back of the chair shows off the adept handling of the Honduran mahogany. Heywood-Wakefield assembled and upholstered the chair to complete the form.